In the last 20 years the technology of communication has been rapidly accelerating. New ways to stay in touch are constantly being introduced and updated. With these fast and relentless developments it can sometimes be difficult for seniors to stay up to date with the most advanced forms of communication. But that does not mean that it’s not worthwhile for them to learn how! New technologies can sometimes be intimidating for seniors, but as time goes on families tend to grow larger and also spread further apart. Busy families can mean that there is less time available for phone calls or visits, and you may soon find that you are not spending as much time under the same roof as you used to. Maintaining a strong familial connection is incredibly important; especially for seniors who are often living alone, or in an assisted living facility apart from family and loved ones. But when technology has made it easier than ever to stay in touch with the people in your life, these obstacles can be easy to overcome. 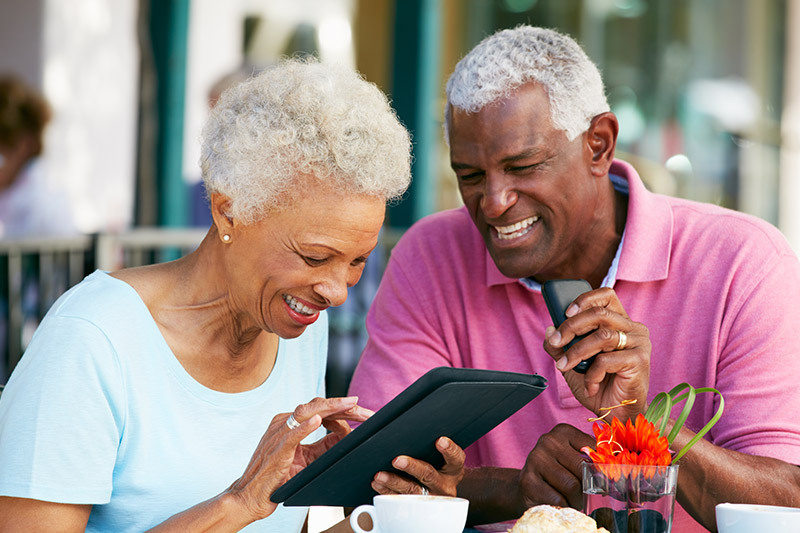 Seniors deserve every opportunity to keep in touch and stay up to date with the lives of their loved ones. Here are some simple and modern forms of communication that we believe seniors can benefit from. When you’re a member of a busy family, you know that the time you have available for lengthy conversations can be minimal. A quick check in via text or email is a great way to stay in touch with a family member that is always on the move. Sometimes it can be easy to dismiss text messaging as being a source of communication that is strictly for teens and millennials, but getting yourself up to speed with this popular form of communication might be the best thing that you can do to ensure you are not feeling disconnected from the people in your life. However, texting does not come without some common complaints. The size of the keyboard on a smartphone can often seem miniscule to those who maybe more used to typing on a computer. And nowadays, younger family members tend to use unique and creative abbreviations more than actual words and sentences. When facing these challenges, keep in mind that texts can now be sent from a variety of devices with larger keyboards such as tablets, laptops, and even desktop computers. And if you’re having trouble deciphering what you’re teenage granddaughter is saying to you, remember that there are numerous helpful online guides to help you decipher the newest abbreviated slang. Skepticism toward new technologies can many times be understandable. But the idea of video chat is something that can easily be seen as functional, beneficial, and even necessary! Maybe you have a number of family members who are scattered all across the country, or maybe the weather is too bad to go out, but you really want to see your grandson’s face. Video chat services and devices make you feel like you’re in the same room, even when you’re miles apart. There are a few popular versions to choose from, all of which give you the feeling of a true face to face conversation. Applications like Skype and Facetime can easily be accessed from your tablet or phone. And even if iPads and smartphones aren’t in the picture, new physical devices like the Nucleus home intercom system can give you a wonderful in person feel at the touch of a button! These home intercom devices like Nucleus provide you with high definition video quality, and a simple, straightforward interface that is both easy to learn and easy to use. Video chat services and devices like these make it easier to check in, catch up, and feel connected with family and loved ones, when getting together in person just isn’t a possibility. Once thought to be a passing fad, it is now hard to imagine a world that could function without the immediate access to information provided by social media. At first, sites like Facebook were only used almost exclusively for staying in touch, but now we live in a world where news stories break on Twitter before they appear on mainstream media, and the President Of The United States tweets more often than he holds press conferences. When social media has become such an important source for not only news, but also communication and entertainment, we should encourage our seniors to become a part of it. At this point, there are an overwhelming number of social media platforms available. This can certainly be intimidating to someone who is just setting foot into this world for the first time. But it’s really just a matter of finding the platform that works best for you. If you’re looking for a lot of communication, updates, and interactions with family and friends, Facebook might be perfect for you. If you prefer to sit back and be more of an observer, while still getting to see pictures of what people are doing, then Instagram may be a better fit! No matter what you settle on, there are plenty of online guides and tutorials that can help you get started. And once you do, there is no doubt that you will begin to feel more in touch with the world. It’s 2017 and communication has come a long way from what it used to be. It’s strange to think that something as common as a phone call is now starting to be considered an “old-fashioned” way to communicate. But now that we find ourselves in an age of constant technological advancements, we should all be doing what we can to keep up. If we want to stay in touch, and up to date, we need to do our best to embrace these advancements so we can all stay better connected. These are only a few of the newest ways to stay in touch. What modern communication technique works the best for you? The team at Nucleus understands the challenges of the modern family, and is working to make it easier for families to stay close and spontaneous. Therefore, making it possible to share what's most important: time together.